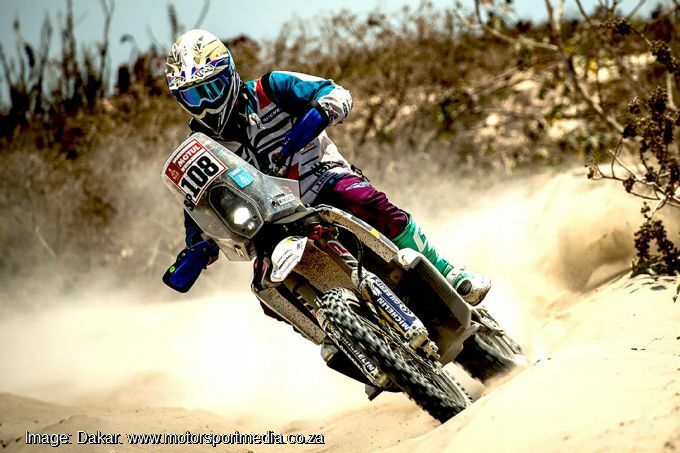 South African Dakar motorcycle rookie hero Kenny Gilbert enjoyed a positive seventh stage in spite of toughest conditions — as usual — on Monday. The stage comprised a 323km jaunt across the dunes around San Juan de Marcona already carved up from racing last week and started half an hour late to allow the fog to lift, but none of that proved a problem to the intrepid Gilbert. “That’s stage seven done and dusted,” Kenny confirmed. ”It was a really dusty and windy day — we did 320km of a mixture of sand, dunes, rocky sections and fesh fesh and a lot of it was already used in stage 3 so it was all beat up from the cars and trucks last week so it was a very rough day. “Other than that I had a good ride — just kept it smooth and got all the waypoints, so all good. “I am really enjoying it out there - it’s really beautiful, there’s lots and lots of sand that made it very demanding today, but other than that a good day in the saddle. ”Tuesday’s eighth of ten Dakar 2019 stages runs 360km up Peru’s desert coast from San Jan de Marcona to Pisco. © 2015 FIM AFRICA All rights reserved. No portion of www.fim-africa may be duplicated, redistributed or manipulated in any form.